The company planning to strip-mine phosphate on the border of the West Coast National Park announced that its mining rights were granted by the Department of Mineral Resources (DMR) on January 30 2015. It has already started constructing a 13km access road, but commenting authorities are concerned that the case may set a precedent, since the application was pending when the government’s new One Environmental System (OES) came into effect. The company, Elandsfontein Exploration Mining, first announced its phosphate project in early January 2014. At the time, the company said the application would take about 18 months, perhaps more. Elandsfontein’s metallurgical manager, Michelle Schroder, said the mining right “was approved on November 26 2014 and notarially executed on January 30 2015”. The application was controversial from the outset because of biodiversity, water and heritage concerns. 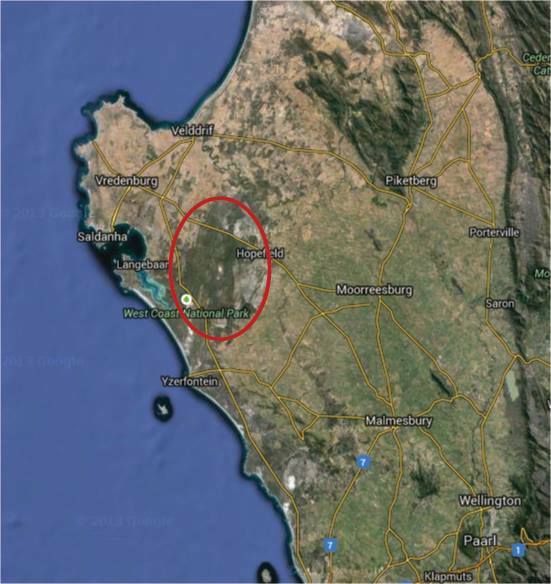 The site lies above two vital aquifers, one of which flows into the Langebaan Lagoon, and the company will be mining inside the upper aquifer unit. The site borders a national park in a critical biodiversity area, and is the location of a world-renowned fossil site. Oxpeckers reported on the controversy over the mining plans in “Battle for the green heart of the West Coast“”. Regulatory and legislative mechanisms are in place to protect concerned citizens and the nation’s resources, and public consultation is a vital part of the process. But documents show that letters were sent by CapeNature, South African National Parks, the Cape West Coast Biosphere Reserve, interested and affected parties, and landowners, complaining about the process and stating that they did not have enough time to comment. A trail of emails that are part of the Environmental Management Programme report shows that, by September 2014, relations between CapeNature and the company had become severely strained. The DMR had requested the company to set up a meeting with CapeNature, but CapeNature’s executive director: biodiversity support, Dr Ernst Baard, replied that a single meeting would not be enough and that “the only reasonable way to meet would be with the DMR chairing this meeting”. He wrote that the main objection was “all of the reports received so far have failed to address our comments and concerns, as well as those of other I&APs [interested and affected parties]”. His organisation had also not received all the required specialist studies. “This project should undergo the highest level of public participation possible with adequate time to review all available information,” Baard wrote. Elandsfontein held two sets of public meetings, in January and September 2014. It said it was following two parallel processes: one under the Mineral and Petroleum Resources Development Act (MPRDA) and one under the National Environmental Management Act (NEMA). In December 2014, the new One Environmental System (OES) for mining applications came into effect. According to the DMR, the purpose of the new OES system is to “streamline licensing processes for mining, environmental authorisations and water use”. In terms of OES, the DMR is the competent authority for processing environmental authorisation applications for mining and listed activities, and for making decisions on such applications. After September, the community did not hear from the company again until its mining rights had already been granted. Elandsfontein has been unable to provide a final report in the exact version it was submitted to the DMR, despite numerous requests. There are also discrepancies between the different available versions. “We have confirmed that we are experiencing some revision control issues with the EMPr [Environmental Management Programme Report], and are working to rectify this,” said Schroder. The company originally said the mine would create around 450 permanent jobs for a life of mine of up to 25 years. The figures have, however, since dropped to around 300 permanent jobs, with 218 to be sourced from the local community, for a life of mine 15 years. The report, however, shows four distinct phases. The second phase clearly shows a figure of 300 jobs, while the last two phases show “300-0”, meaning employment figures could possibly fall further, from as early as the year 2019. Jobs were promised to the communities of Hopefield, Saldanha and Langebaan. However, the Langebaan community was not consulted in January 2014. The company’s social and labour plan states that a meeting was held with the municipality, where the company was told that community engagement is based on a ward system, and if a project is located in a particular ward, then that ward must be consulted. The report states that this approach was adopted and the Hopefield community was consulted. However, ward maps clearly show that the site falls well within the Langebaan ward, and not Hopefield’s. At the meeting, Smith asked whether a skills audit shouldn’t rather have been done first. “How do we know our people will be accommodated? We were never consulted. For example, us fishermen, we’re thinking to ourselves, is this not going to have an impact on our lagoon? Olivia Braaf, the environmental practitioner acting for Elandsfontein, assured Smith that further meetings would be held. However, no further meetings were held until after the company had already received its mining rights. When asked why the Langebaan ward committee members had not been consulted, particularly on something that could impact the lagoon, a Ramsar site, ward councillor André Kruger said it was not his role and that the project had been advertised in the newspaper. He also said he had not been privy to previous meetings and that he merely went to the second and only session held in Langebaan, in September. However, records show that Kruger was on the first I&AP database released as early as April 2014. At a public meeting held in Hopefield on March 11 2015, the community hall was filled with jobseekers. However, other community members felt the consultation process had been severely flawed, and said they were concerned about the lack of clarity surrounding the new OES. A man asked Braaf whether an environmental impact assessment (EIA) had been done. Her company, Braaf Environmental Practitioners, had originally said this would be the case, not only via email but also in glossy, full-colour trifold brochures handed out at the meeting in September 2014. “It sounds nice,” said the man, “but the answer is ‘no, it [the EIA] didn’t happen’”. “Tonight is my meeting, and I will not allow for the people here before me to be denied [opportunities],” Schippers said. Those concerned about the mine’s impacts left the meeting as the rest of the community jeered. However, the meeting notification sent by Braaf had explicitly stated that the purpose was to answer questions and concerns and to “provide feedback and explain the implementation of the environmental management programme”. Throughout the process, the mayor said he was merely a facilitator between the mine and his constituents. “My mandate is economic development in the area and I intend to fulfil it”. He had promised a meeting with his constituents, without the mining company present, but this never transpired. In all the available documents, and there are hundreds, if not thousands of pages, a single handwritten note from the mayor appears, stating that he had been in discussions with the mine, and that “because the project will create a few hundred job opportunities, I am in support of it”. Elandsfontein sent in bulldozers and started clearing large tracts of natural vegetation to construct an access road to the site, before the DMR had approved their EMP report, which is dated 20 February. Questions to DMR about whether authorisations had been granted from the Department of Water Affairs, the municipality or from Heritage Western Cape remain unanswered. 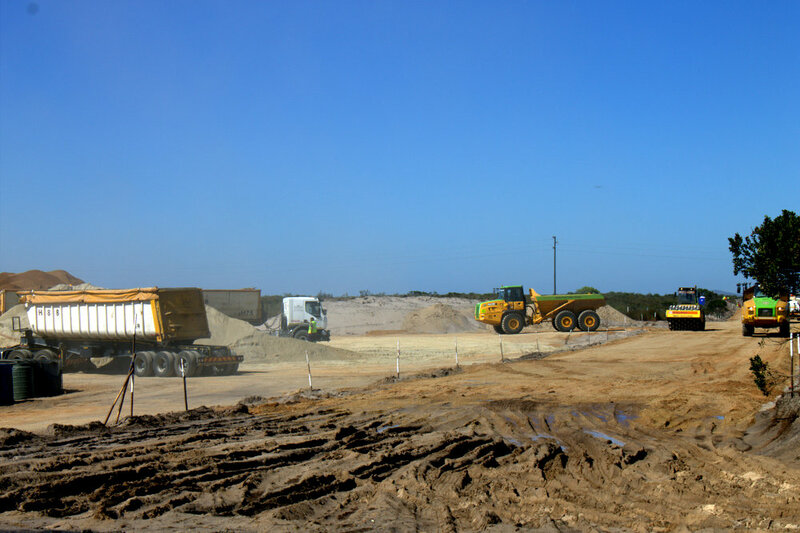 André Oberholster, administration manager for Saldanha Bay Municipality, was also not aware that construction had started and referred the matter to Lindsey Gaffley from the town planning department. Gaffley said he was aware of construction, and referred the inquiry to the municipality’s media liaison officer. However, the municipality failed to clarify how the road activities had started, under which authorisations, whether an impact assessment had been done, or whether the process had been advertised and the public engaged. Heritage Western Cape issued three Stop Works Orders, but the company failed to comply with them. Heritage then approached the High Court for an urgent interdict, on the basis that Elandsfontien had received a mining right from the DMR without satisfying the National Heritage Resource Act. 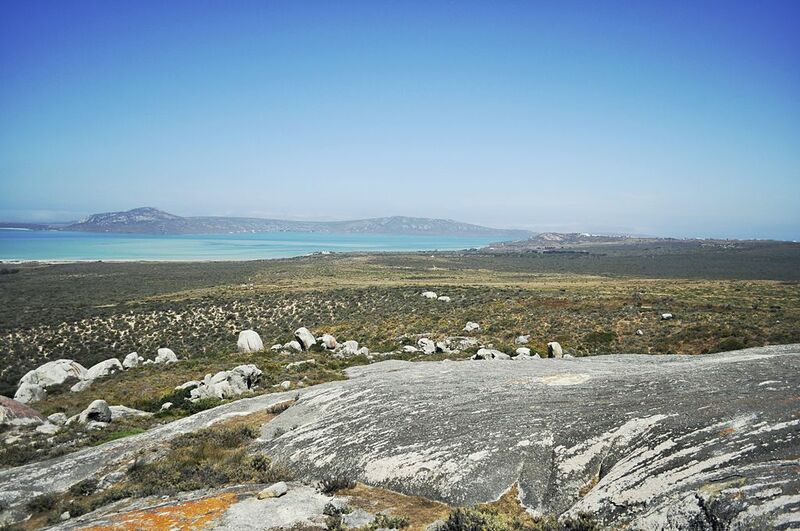 In a written statement released by Heritage Western Cape, chief executive Andrew Hall wrote that Elandsfontein “is home to a renowned fossil site dated from approximately 500 000 years ago, and is the location where the famous Saldanha Man is found. “This is known to be the southern-most hominid find ever identified, and the oldest known specimen of the hominid lineage in the Western Cape,” Hall said. The parties have since decided to settle the matter out of court and are currently working towards an agreement. She said the EMPr issued by the DMR after the approval of the mining right served as the environmental authorisation, and that the DMR is the responsible authority to issue and implement environmental provisions related to mining. “DEA&DP [Western Cape Department of Environmental Affairs and Development Planning] no longer administers any environmental legislation with respect to mining-related activities. The environmental approval for the construction of the road is part of the approved mining right,” Schroder said. However, a few days later, Schroder wrote: “We were granted a schemed [sic] departure from the SBM [Saldanha Bay Municipality] for prospecting. All the activities that we are currently busy with, including the access road, is covered by the prospecting right. Rudolf van Jaarsveldt, head of communication at the Western Cape Department of Environmental Affairs and Development Planning, confirmed that the company withdrew its applications for environmental authorisation in terms of the NEMA EIA regulations in February, and that the files were closed by the department. He said although the DMR had granted a mining right to the company, it still had to obtain environmental authorisation from the DMR to undertake the listed activities in terms of the NEMA EIA Regulations, which are triggered by the mine. Should it be found that the company commenced unlawfully, the matter would be dealt with by the DMR, he said. Marthàn Theart, an attorney at the Centre for Environmental Rights, said before December 8 2014, the environmental management of mining was regulated under the MPRDA. An applicant for a mining right had to submit an environmental management programme for approval by the DMR under the MPRDA. Environmental authorisation, governed by NEMA, was only required when listed activities such as the building of roads were undertaken in conjunction with the mining operation. “Under the OES, this changes fundamentally,” he said. “The environmental management of mining, in addition to listed activities, is now governed by NEMA. Theart said there were transitional provisions and that the old rules should still apply to applications such as Elandsfontein’s that were pending as at December 8 2014. “There is considerable uncertainty regarding commencement of the OES due to the staggered commencement of the various amendments to the MPRDA and NEMA. What we do not want is for mining companies to be able to abuse this uncertainty to get authorisation for mining which they would not otherwise be able to get,” he said.